Joss Whedon has recently taken over the reigns of the upcoming Justice League movie after Zack Snyder stepped away for personal reasons. I'm not going to go into any details of those reasons, but if you're curious, a simple Google search will give you the info you're looking for. Anyway, this blog isn't about movies, it's about comics. Key issue comics to be exact. The only reason I mentioned the movie above is because there is a lot of speculation that we may be seeing Henry Cavill don Superman's black suit in the film, and this is the comic where we are first introduced to it. Back in the 90's, DC decided that they were going to kill off one of their most famous characters. 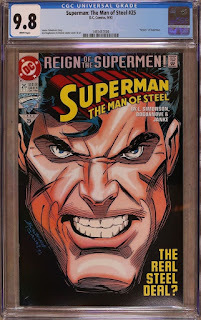 If you were into comics back then, you probably remember all of the hype around this story line and probably even had a copy or two of Superman #75, the issue where Supes meets his fate at the hands of Doomsday. But, as we all know, in comics, nobody stays dead forever. If you remember the Death of Superman, then you probably also remember the Reign of the Supermen story line that came out after that. In this story, that runs for several issues in several titles, there are for "Supermen" that are claiming to the be real Superman. One of the "Supermen" actually turns out to be evil and becomes the super villain in the story. I don't want to give too much away here, so I'll leave the identity of that character a mystery, for now anyway. Regardless, at the end of this issue, a giant robot comes up out of the water, and two of the Supermen decide that it's there to destroy the city and go toe to toe with it, until they finally stop it. As this massive machine is disabled, a hatch or doorway opens up, and this man is basically birthed from it. 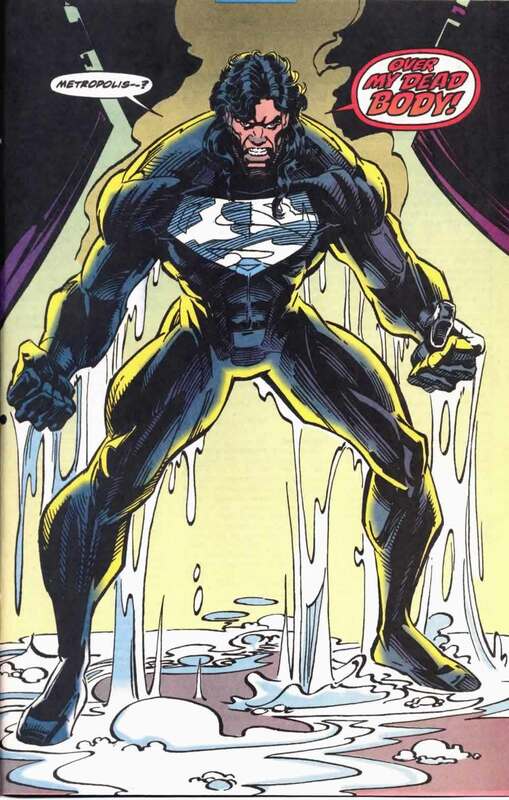 On the last page, it is shown to be Superman, and he's in his black suit and sporting a great looking mullet. Now that Supes has returned, he still has to prove to the world that he is the one true Superman. So the Reign of the Supermen story line goes through to The Adventures of Superman #500, where DC officially considers Superman to be back from the dead for good. To the best of my knowledge and through my research, I could only find one variant for this comic, and that is the newsstand edition. Newsstand editions have become more sought out lately. As we got closer and closer to the millennium, these editions started to become a lot harder to find, making up only a fraction of the actual print run. At the time when this comic was released, it was only around 15%. As we got further along and closer to today, those numbers get even lower. Anyway, if you want one of these "rare" newsstand editions, click the pick and it with shoot you over to the current eBay listings. The census for this book is really low at this time. To be honest, this isn't a really sought out key issue. In fact, it's probably still unknown by a lot of people, and the census numbers reflect that. 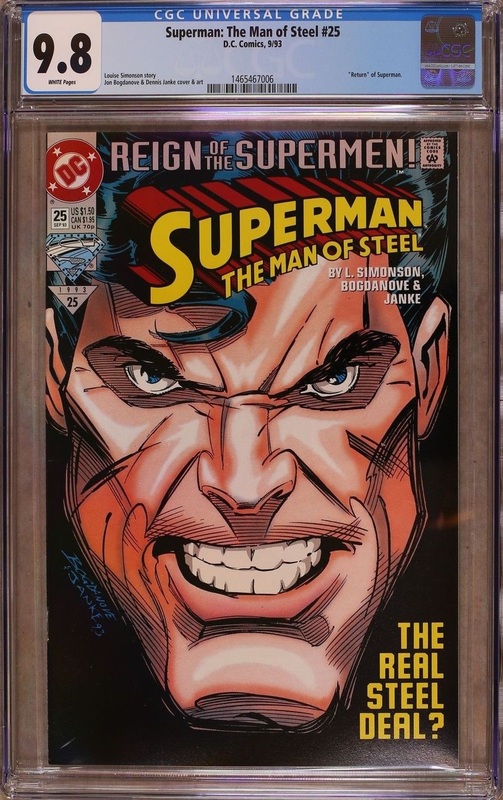 To date, there have only been 41 copies graded by CGC. Of those, 22 of them are graded a highest 9.8 NM/M. CGC doesn't differentiate between the Direct and Newsstand editions, so how many of each are out there is unknown. If you're looking for a copy, I wouldn't go any lower than a 9.8. There are a few of them out there and they're still very affordable as you will see in the next section. GoCollect, my go to site for comic values has only a few points of sales information data for this comic. In the two years worth of information available, values for this comic hasn't really gone anywhere. Back in 2015, you could snag a CGC Universal 9.8 NM/M copy for only $75. The last sale on June 16th went for only a few dollars less at $62. So, as you can see, there isn't a lot of demand for this minor key issue and you can still snag a copy for well under $100. Now if you really want to add this comic to your collection on the cheap, you can take a gamble on a raw copy. If you have a good enough eye, you may be able to snag a copy for damn near cover price, which was only $1.50. But be warned, if you send in a copy thinking it's a 9.8 NM/M and it only comes back from CGC/CBCS a 9.6, you'll have lost money. It would cost you more to get it graded than the book is worth. Either way, good luck and happy collecting.